Friday, August 12: Marina & Bernardo are so excited to be the third concert in the songwriter series Schooner Serenade! Held aboard the stunning Schooner Adventure as she is docked in her home port of Gloucester, MA, this series features New England songwriters lending their tunes to the valuable cause of preserving this historic ship’s legacy. Marina & Berna will be debuting new music from their forthcoming album, aptly entitled Tide and Stars. Tickets: $20 / $15 for Adventure members. Click here for more details & to purchase your tickets! On a sultry summer evening, a hot breeze blows off the land over the cool Atlantic, bringing with it the cries of seagulls and the smells of an industrious downtown. It’s just before 5pm, and already the streets are jammed with workers eager to make an early return home after a long day. I pull around the generous bend of Harbor Loop, catching blue sliver glimpses of the harbor between buildings and street lamps, and park beside the entrance to Maritime Gloucester. The enormous masts of the mighty Schooner Adventure, now moored peacefully at her pier, peek out over the rooftop. The pennant bearing the ship’s namesake flutters in the wind from the highest mast, its swallowtail playful and proud. Fair winds, and warm — perfect for a sunset sail. The breeze stiffens as the sun begins to set, and by the time all are aboard it’s strong enough to justify a delicate maneuver: departing from the dock under sail, with no help from the motor. The crew hauls the golden sails partway up and they billow and swell as the ship bows elegantly and silently away from her slip. She moves so gently, as if she is embarrassed by her own beauty. A real lady. Once we’re safely away from the pier and in the middle of the deep harbor — fittingly deemed “Le beau port” by Samuel de Champlain centuries ago — I fall in line to finish raising the sails. Keeping the rhythm set by the crew, we lean and pull, sigh and shout, as the thick, coarse lines give our smooth “city folk” palms a run for their money. “Hey, aren’t you a guitar player? You should be watching those hands!” someone calls to me over their shoulder. I smile and shrug, proud of what little calluses I do have on the tips of my fingers, and oddly relishing the tingle of my now-pink palms. It’s a satisfying kind of suffering, to burn your palms hauling a line: comparable to that good kind of sore after a long run, but somehow more immediate, more fundamental. You’ve got to harness the wind to escape the land. Today the wind proves itself to be quite the stallion, filling the sails with the joyous bluster of newly discovered strength. Adventure lays back, leisurely, leaning her dark shoulders into the ocean. We pick up speed as we pass the dog bar (breakwater) at the edge of the harbor. 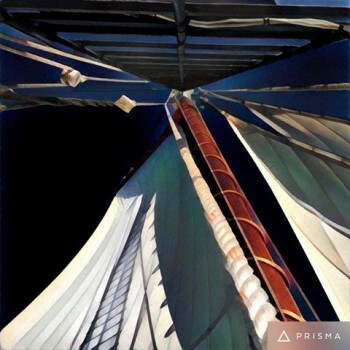 The blunt knockabout bow heads south towards Boston; the wind picks up and the ship leans further in, her decks tilting at a sharp angle, the lines beating out an exuberant battle cry against the sails’ taut canvas. The wind increases steadily, as does the frenzy of the singing lines and the heartbeats of all souls aboard. Though she reaches a thrilling speed of just over 10 knots, Adventure is just as graceful flying through the open water as she was in her delicate departure from the dock. Her new rigging relishes the wild wind, and shamelessly sings its praises; her wise old hull, cracked many a time by ice and sea and salt and heat and caulked by generations of seaman’s worn hands, silently drinks in the glory of the ship’s rebirth. Built in Essex, MA in 1926, Adventure was the last dory fishing schooner left in the Atlantic when she retired in 1953. She was the biggest moneymaker of all time, a “highliner,” having brought in nearly $4 million of cod and haddock throughout her illustrious career as a fishing vessel. She spent the next 34 years windjamming off the coast of Maine, and her speed and elegance earned her the title “Queen of the Windjammers.” Then, in 1988, Captain Jim Sharp (who had owned Adventure since 1965) donated her to the people of Gloucester (her home port) and to Adventure, Inc., a non-profit organization whose mission is threefold: to restore & preserve Adventure in perpetuity; to use her as a research and educational resource; and to sail her as a symbol of Gloucester’s rich maritime heritage. This marks the second full summer Adventure has been back in the water after 20-odd years spent on dry land for renovations. The joy of her resurrection is tangible in the singing lines, the swooping sails, and in the shining faces of captain, crew, and passengers alike. As we approach Salem harbor, we come about in a broad, smooth arc. The boom swings effortlessly across the deck, and the sails billow and shake for only a brief moment as they find the wind. The Captain catches my eye from his post at the wheel and I pull out my guitar, settling down on a bench, looking towards the bow. Although the wind has died down since the jubilant departure from the harbor, I still have to brace myself (and my mic stand) with one foot steady on the deck, leaning into the weathered boards to keep my balance as I begin to play. At this moment I am particularly grateful for my coastal upbringing, and for my sea legs, without which both I and my precious guitar would probably have ended up overboard. I play and sing for an hour or so, and the setting throws into sharp relief the fact that I grew up here, that this place and these waters are inextricable from myself and my songs. The sea, the horizon, the rocks, the wind — and the idea of a safe harbor solidified through longing from afar — these things often find their way into my songs and lyrics. These themes are all too familiar to the fishing families of Cape Ann, and have seeped into the island’s culture so that even first generation locals like myself can perceive and appreciate them. My voyages away from home have not been by sea, but they have been far, and frequent. I can understand, at least on the surface, the concept of feeling at home while on the road (or on the water), in flux — the apparent contradiction between the happiness and freedom of travel, and nostalgia for the fixed place in the world that formed you — and I wrestle with this through my music. And as I play, an eerie familiarity settles over me, as if Adventure already knows these songs — she’s heard it all before. Breathing the salt air and singing into the sunset, it really feels like we are in another world — as if Adventure is floating freely in a summer snow globe filled with flecks of gold instead of snowflakes. We are untouchable here, with nothing but wind and song and sea to fill our hearts. We lounge on the decks alongside ghosts of sailors past, whose feet wore down the boards, whose heads rested below in the fo’c’s’le, whose voices echoed over calm seas or disappeared into furious winds, and we join them in awe and humility before the benevolent, endless, wild sea. And with a reverence far deeper than our own — hard-earned over a 90-year love affair with the Atlantic — Adventure bows and sighs, her hull kissing the wavelets, her sails blushing at their own beauty. BIG NEWS! I am so excited to be collaborating with the Schooner Adventure on producing Schooner Serenade, a summer songwriter series to benefit this historic ship! This monthly concert series will be held aboard the stunning Schooner Adventure while she is docked in her home port of Gloucester, Massachusetts, and will run from May through August. Featuring singer/songwriters from Cape Ann and beyond performing their original music, this promises to be a series of shows not to be missed. 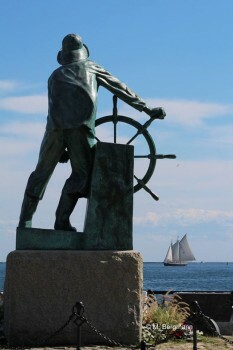 Beyond being America’s oldest seaport, Adventure’s home port of Gloucester, MA is also a vibrant artistic community that has nurtured and inspired renowned visual artists, poets, and musicians throughout the centuries. Schooner Serenade unites Gloucester’s unique cultural history with Adventure’s crucial mission to educate on maritime, cultural, and environmental issues and to restore and preserve her for future generations love of the sea. 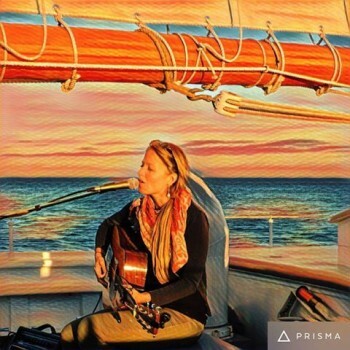 Held aboard Adventure while she is docked in her historic home port, Schooner Serenade features talented singer/songwriters from Cape Ann and beyond whose original music and live performances have earned them local, regional, and international acclaim. A National Historic Landmark, the Schooner Adventure is among the last surviving Grand Banks dory-fishing schooners, the last of the “Gloucestermen”. An icon of the American fisheries and a floating classroom for maritime history and environmental education, Adventure is an invaluable, living monument to our fishing and maritime heritage, both in Massachusetts and America as a whole. A Cape Ann favorite whose songwriting has earned him co-writes with such illustrious songwriters as Tammy Wynette, Shania Twain, and David Mallett, and whose dynamic live performance has earned him opening slots for such greats as Bonnie Raitt, Earl Scruggs, J. Geils (and many, many more), Allen Estes is a local treasure who is not to be missed. Combining a full, rich voice with exceptional fingerpicking skills and honest, elegant songwriting, Estes masterfully mixes country, folk, and blues in his songs. Learn more at allenestes.com. 3rian King (voice, keys, guitar) and Nathan Cohen (violin, trumpet) are the founders of the neo-cabaret band, What Time Is It, Mr. Fox?. The pair like to bend and blend genres, allowing the song to be what it needs to be in order to express its emotional core. Together they have packed houses in Boston, NYC, and throughout the country. 3rian’s strong gender-defying voice has been compared to Annie Lennox, Alison Moyet, and Amy Winehouse. Winner of Songwriter of the Year at the 2016 New England Music Awards, Daphne Lee Martin combines a unique vocal style based on the chanteuse sticky-sweetness of Blossom Dearie, the twang of Patsy Cline, and the indie wistfulness of Neko Case with original, timeless melodies and arrangements that hark back to harmony-rich maritime folk songs, tin pan alley writers of the 20s and 30s, and of course, Tom Waits. A songwriter with a mission, Martin has used her music as a means of teaching sustainability, environmental science, and the importance of traditions to the communities of the future during the several years she spent within Pete Seeger’s Hudson River Sloop Clearwater community. Her deep experience uniting community-based initiatives with her unique and award-winning songwriting makes her a perfect fit for Schooner Serenade. Learn more at daphneleemartin.com. Combining a background in jazz with folk Americana, blues, and an indie edge, Cape Ann singer/songwriter Marina Evans’ sound is all her own. Marina’s strong, sultry vocals and the raw grit of her husband, producer, and musical partner Bernardo Baglioni’s slide guitar bring her unusual melodies and lyrics to life. Having released 3 original EPs and a full length album in recent years – two of which were written and recorded abroad in Bernardo’s native Italy – the pair has toured across the U.S. and internationally. Marina’s passionate live performance has earned her two consecutive nominations for Female Performer of the Year at the New England Music Awards, as well as opening sets for such folk legends as Judy Collins, Jonathan Edwards, and Loudon Wainwright III. Debuting brand new material from Marina’s forthcoming album fittingly entitled Tide and Stars — this dynamic duo is not to be missed. Learn more at marinaevansmusic.com.